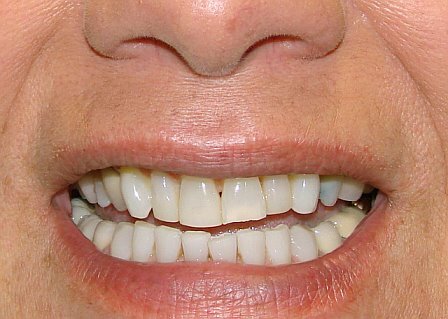 This 50-ish woman has seen her front teeth worn down over the years. Also she would like to get rid of the “dark space” on both her left and right sides. 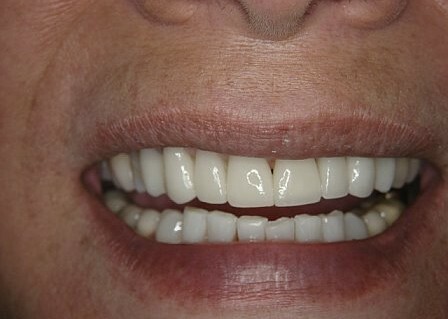 Six porcelain veneers and two porcelain crowns were constructed. She is very happy with the result. Observe the incisal edges of her upper front teeth follow the curvature of her lip. The dark space along the “buccal corridor” was eliminated to yield an overall youthful appearance.